Road Less Travelled: Riding to Khardung La - a Memory To Behold! Every biker waits eagerly an entire year for the summer months of June to August- the time when snow is cleared in high altitude Himalayas and the mountain passes are open, perfect time for a road trip to Leh. The icing on the cake is riding your bike on the treacherous road that takes you to ONE of the highest motorable roads on Earth- the Khardung La at 18300 feet above sea level. Also known as the Pass of Lower Castle, it is the gateway to Shyok and Nubra Valley and the far end being the Siachen glaciers. Even before the roads were laid, it was an important trading route to Kashgar in Central Asia with close to 10000 horses and camels that used to ply on this route annually. The Khardung La Road, built in 1976 and maintained by BRO, is of utmost importance as it carries supplies to Army posted at Siachen. It was made open to public motor vehicles from 1988 and since then many a automobile and bike companies have run expeditions on this pass. Though claimed to be the highest motorable road on Earth, it is one of the many highest roads. 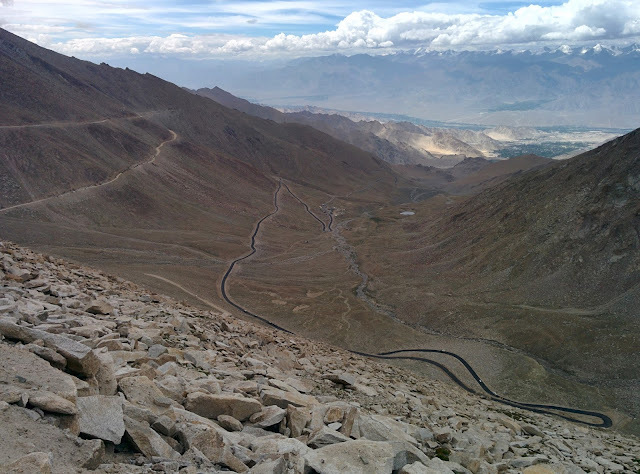 Khardung La is 40 km away from Leh and the climb is very steep from 14000 to 18000 feet. Hardly a few kilometers into the ride, for the first time in our trip we were stopped by the Leh taxi union guys. 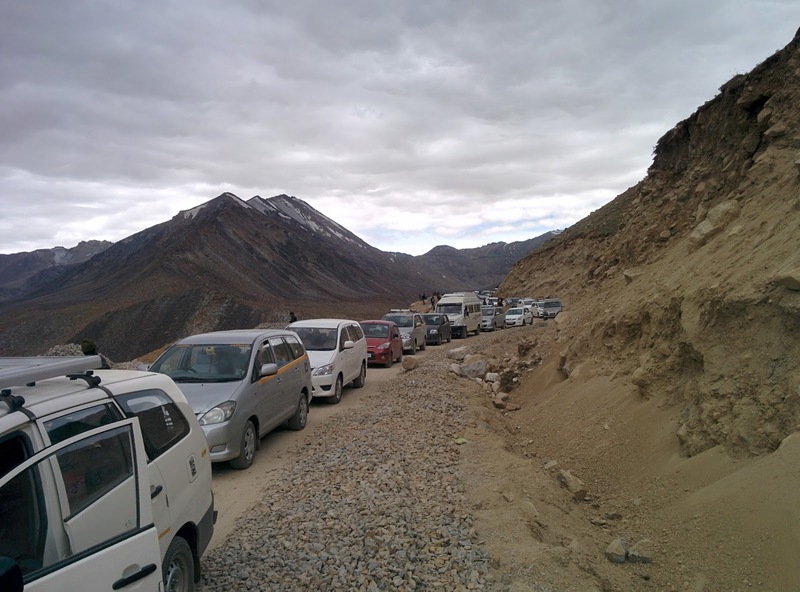 The Leh taxi union does not allow vehicles apart from J&K registration to visit Nubra and Pangong Tso as they feel other states Taxis are eating up their income. Other state vehicles that are not rented are allowed without any problem, Since we were on our own bike we just had a casual chat and they did not even bother checking our bike papers. But they were pretty serious in their job and were scrutinizing other rented bikes and were asking for rental receipt to check where the bike was hired. We were amazed by the winding roads and the gorgeous scenery that welcomed us. No words can explain the beauty that was around us. En-route, there is a view point from where the beautiful snow clad mountains are visible and is a sight to behold. A perfect place to stop over and take some memorable pictures. The road condition until South Pullu check post, approx. 24 km, is narrow but spotless and awesome black top. Also note that the roads until South Pullu though narrow are a treat but can quickly turn dangerous as there is a lot of inward heavy vehicular traffic and riding on those narrow roads can be challenging with a few of the trucks refusing to give way for oncoming vehicles so it's best to be cautioned and ride safe. 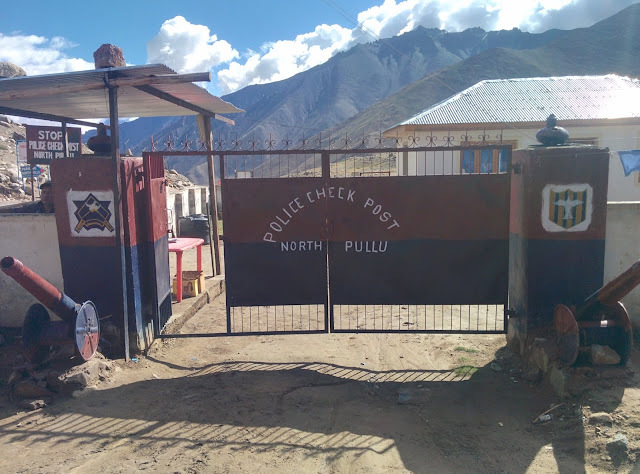 At the South Pullu check post we were asked to provide a self declared form with traveler details by the J&K police. The forms are available in a shop opposite the check post for Rs 10 each. Just basic information about the vehicle and traveler are required. If you are travelling further from Khardung La to Nubra valley, an additional form is required and this form needs to be submitted at the North Pullu check post. However, do regularly check official site to know if there are any changes in permit procedure. The road condition from South Pullu to Khardung La and North Pullu, if you are heading to Nubra valley, close to 15 and 30 km respectively, will be an absolute test for any rider and pillion but it definitely guarantees breathtaking mountain vistas and adrenaline rush. The snowy mountain ranges are any Nature lovers or photographers delight. This road is a testing condition for man and the machine. To enhance our motorbike's performance. a few kilometers before reaching K top, we removed the air filter. This helped in ensuring that the bike does not struggle much and smoothly climbs the altitude. However, if you still find your bike lagging and not able to give you the desired power output, tweaking the carburetor setting would definitely help. All you need is a screwdriver and obviously you need to know what you are changing. Reaching Khardung La Top is an accomplishment in itself. The views of the valley, the mountains and the clumps of ice around makes the entire trip not just worthwhile but the whole journey becomes an experience in itself, a once in a lifetime experience. To celebrate, there is chai and piping hot maggi that is available at the army canteen here. Khardung La has an army base. Also, you will need to get in a long queue to get a picture clicked next to the sign board. It would be smart and very sensible to leave very early from Leh. There are a lot of nalas or glacier melts that one has to encounter en-route and as the day progresses the intense heat melts the snow rapidly and the gentle stream like nalas gain massive momentum and are like raging river. This makes crossing these nalas extremely difficulty for bikers so the earlier one crosses over the better it is. Always remember to maintain good momentum (not over speeding) while crossing nalas. If the water is rough ask your pillion to get down and crossover by foot. Waterproof shoes and gaiters would be life savers in the unfortunate event of you putting your foot down as these could save your feet from getting wet and help in avoiding frost bites. Leave as early as possible to avoid massive nalas and traffic jams. Be geared up as it can get cold. Keep rain gear handy especially if you are on the bike as the weather is unpredictable . Be patient, traffic jams are a norm here. Keep in mind there are no places to stay on the way so time your trip accordingly. Carry some munchies as you do not know how much time you will spend reaching K Top. Also ensure that you do not litter the place. Carry all ID and vehicle related documents. Thanks Rupam, hope you have a good time visiting Khardung la.